"The shark has seen the turtle underneath it, and rolled to protect itself by putting its thick upper-surface skin between it and the potential threat," says Pierce. Does this mean whale sharks actually feel threatened by passing reptiles? Not really. The likely explanation is that the shark simply saw a dark shape in the water and reacted pre-emptively. "I've seen them do this when dolphins have rushed in," adds Pierce. "Then the shark realised it was a dolphin (at the same time I did) and we both relaxed." These docile filter feeders have even been spotted performing the twisting feat near passing freedivers – but this is rarely caught on camera. MORE: Idiot shows us why riding whale sharks is dangerous and stupid. 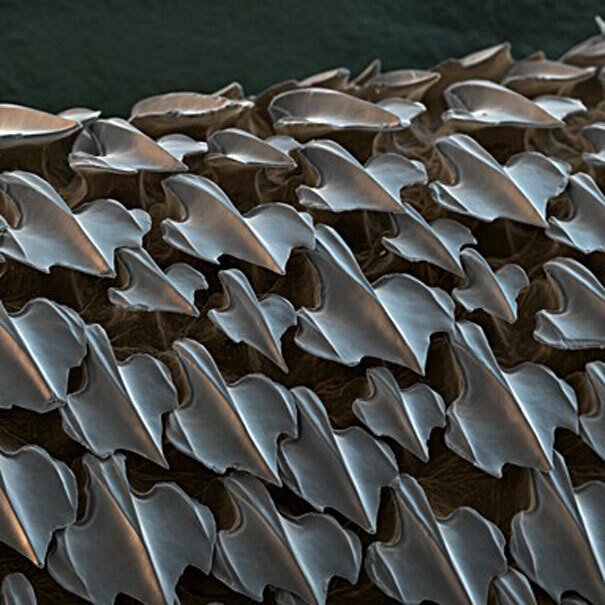 Not only is a whale shark's top-side skin covered in the tiny, tooth-like scales (known as dermal denticles) typical of all sharks, but this barrier is also an impressive four inches (10cm) thick – it's some of the most impenetrable skin in the animal kingdom! This limits a whale shark's potential predators to killer whales, great white sharks and the occasional tiger shark. "There's also a very thick connective tissue underneath the skin," explains Pierce, who has performed several dissections on stranded whale sharks over the years. "It's hell on kitchen knives." Sadly, the tough exterior can't protect the sharks from humans. Although most whale shark fisheries worldwide have been officially shut down, hunting of the ocean giants for their oil, fins and meat persists to this day. And like the great whales, these animals spend ample time near the surface, making ship strike a significant threat to their survival.